Critics warned the changes could wipe out grouse colonies as drilling disrupts breeding grounds. BILLINGS, Mont. — The Trump administration moved forward Thursday with plans to ease restrictions on oil and natural gas drilling, mining and other activities that were put in place to protect an imperiled bird species across millions of acres in the American West. Land management documents released by the U.S. Interior Department show the administration intends to open more public lands to leasing and allow waivers for drilling to encroach into the habitat of greater sage grouse. Critics warned the changes could wipe out grouse colonies as drilling disrupts breeding grounds. Federal officials under President Barack Obama in 2015 had adopted a sweeping set of land use restrictions intended to stop the birds' decline. Interior Deputy Secretary David Bernhardt said the agency was responding to requests by states to give them more flexibility in how public lands are managed. He said the goal to conserve sage grouse was unchanged. "I completely believe that these plans are leaning forward on the conservation of sage grouse," Bernhardt told The Associated Press. "Do they do it in exactly the same way? No. We made some change in the plans and got rid of some things that are simply not necessary." 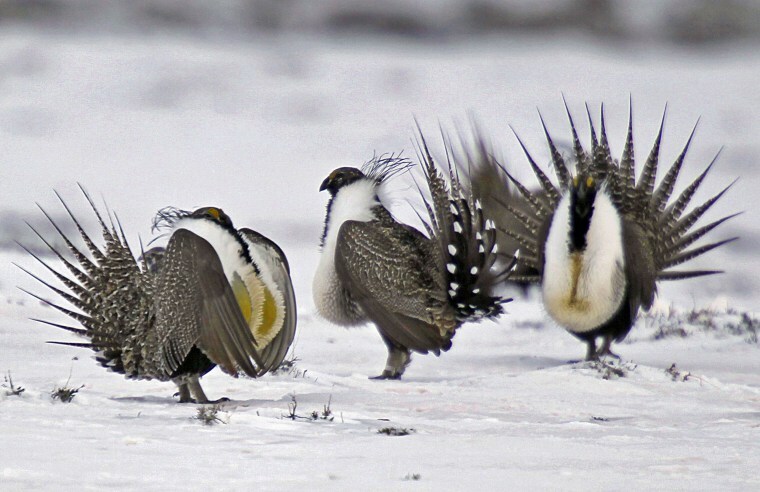 The $5.6 Billion Bird: How Will The Sage Grouse Fight End? The changes drew a sharp backlash from conservation groups and wildlife advocates, who warned excessive use of drilling waivers could push sage grouse onto the list of threatened and endangered species. "If you allow exception after exception, that might make sense for a particular project in a particular spot, but you add them all together and you have death by a thousand cuts," said National Wildlife Association Vice President Tracy Stone-Manning. Sage grouse range across about 270,000 square miles in parts of 11 Western U.S. states and two Canadian provinces. Their numbers plummeted in recent decades. In 2015, after determining the Obama administration's plans were sufficient to keep the bird from slipping toward extinction, the U.S. Fish and Wildlife Service pledged to revisit its status in five years. The agency revealed Thursday that it no longer plans that 2020 status review, often a first step toward determining if greater protections are needed. Spokeswoman Jennifer Strickland told the AP that the Fish and Wildlife Service is not legally required to complete a review. Instead, it will work with the Western Association of Fish and Wildlife Agencies to document the effectiveness of the conservation plans. Under President Donald Trump, Interior Secretary Ryan Zinke has vowed to lift obstacles to drilling, and grouse protections have long been viewed by the energy industry as an obstacle to development. The new plans remove the most protective habitat designations for about 13,000 square miles of public land. Those areas, considered essential to the species' survival, were a centerpiece of the Obama policy. The Trump administration also wants to drop some requirements to prioritize leasing for oil and gas outside sage grouse habitat. Utah Gov. Gary Herbert, a Republican, said Thursday's announcement showed federal officials heeded the state's desire for changes to the 2015 plans. "This is a great example of federal leaders listening to state leaders, valuing their expertise, and changing their plans based on that input," Herbert said in a statement. But U.S. Sen. Catherine Cortez Masto, D-Nevada, said the Interior Department "has decided to put the interests of the oil and gas industry ahead of the best interests of Nevadans." "This new plan undermines the delicate balance Western states had struck to ensure the protection of sage grouse populations and strengthen economic development across the western United States," she said. Sage grouse are large, ground-dwelling birds known for an elaborate mating ritual in which males strut around breeding grounds with large, puffed-out air sacs protruding from their chests. They once numbered in the millions. The U.S. Fish and Wildlife Service now estimates there are 200,000 to 500,000 of the birds after energy development, disease and other causes decimated populations in some areas. The Trump administration's proposal would reverse or modify the Obama-era protections in seven states — Wyoming, Nevada, Utah, Colorado, California, Idaho and Oregon. No significant changes were proposed in Montana, Washington or the Dakotas. The oil and gas industry chafed at the old rules. Once Trump took office, industry representatives lobbied the administration to give more recognition to changes in drilling practices that reduce land disturbance. "We can do both — protect sage grouse and move forward with responsible energy development," said Kathleen Sgamma with the Western Energy Alliance, which represents more than 300 oil and gas companies. "We've reduced the size of well pads, reduced the numbers of wells. And we had done all these things and the prior administration assumed development was taking place like it was 20 years ago." Governors from several Western states previously raised concerns over a related federal directive from the Bureau of Land Management that would limit a type of land swap that can be used to preserve habitat for the birds. Without land swaps and related forms of compensation to offset habitat damage, the governors said it would be harder to help the sage grouse. In response, the Interior Department Thursday revised the directive to say federal officials would consider state-mandated or voluntary proposals for land swaps or similar offsets. "Where there's a state requirement, we require in our permits that they comply with state requirements," Bernhardt said. The governors and the public get another chance to weigh in before a final decision is expected in early 2019.